With an unrivaled record of more than two million downloads in 2002, JBoss application server is one of the most downloaded and most used software in the industry. 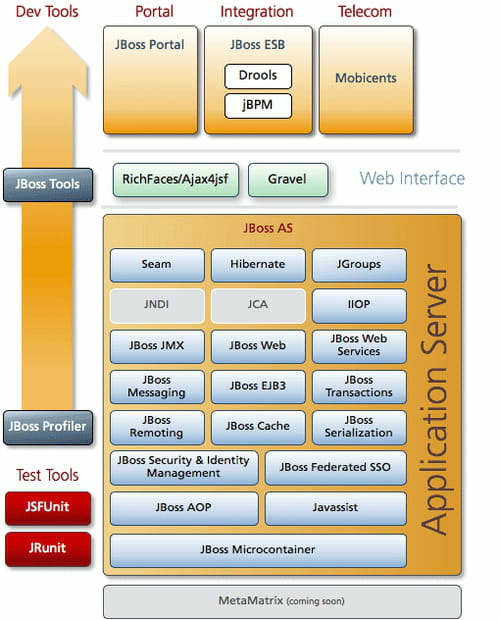 JBoss is a J2EE application server (Java 2 Enterprise Edition) which is implemented in Java and open source. Aspect-oriented programming (AOP): this is one of the best features of JBoss. The aim of AOP is to increase modularity by allowing the division of cross-cutting concerns. It is integrated with programming methods and tools to support the modularization of concerns. Clustering: this function is aiming at viewing a set of loosely connected computers as a single system. Clustering can improve performance and ease of use of a single computer. Distributed deployment: with this feature, thanks to a computer network, multiple autonomous computers can communicate to each other. They interact with each other so as to achieve a common goal. It can also help to solve computational problems which are solved by one or more computers. Other features: JBOss also supports Java Authorization Contract for Containers (JACC) integration, Java EE Connector Architecture (JCA) integration, Java Management Extensions, Java Message Service (JMS) integration, Java Transaction API (JTA), Java Naming and Directory Interface (JNDI), JavaMail, Teiid data virtualization system and much more. JBoss is robust, comprehensive, secure and economical. Latest update on February 1, 2013 at 07:32 PM.